Commonly called Angel’s Trumpets, Brugmansia plants were previously called Datura, whatever the name they are readily available for sale online. A native to South America, Brugmansia are a small to mid-size tree with large, strong-smelling, trumpet-shaped flowers hanging downward. Flower colours vary from pure white flowering angels trumpets (Brugmansia candida) through to pinks and reds depending on species and cultivar. Requiring a well mulched humus rich soil, moist but well drained and a reasonably sunny position. Brugmansia do not like it really hot so a position in morning sun is best in warmer climates. Water soluble fertilizer is probably the best as Brugmansias are a hungry plant so feed every week during the growing season. 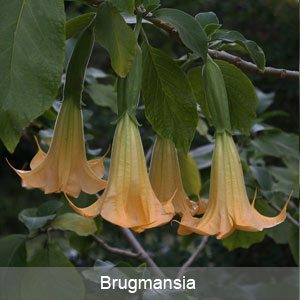 Brugmansia will grow to 2 – 3m but can be cut back in winter to keep in shape. Brugmansia or Datura plants that will not flower are probably not getting enough light, although they like part shade, to little light will inhibit flowering. Pruning Brugmansia should be carried out with gloves on, plants can be cut back to maintain shape or pruned to a standard form. They are best pruned in summer when they can put on some new growth before winter, this tends to prevent die back. You will often notice growth nodes and shoots rather low on the plant and they can be pruned back to these. They propagate readily from cuttings. A common problem in cooler climates is for Brugmansia leaves to yellow and fall off. So if its winter and cold and wet then don’y worry to much about yellowing leaves, they should come back when the weather warms up. At other times of the year the problem could be, hot and dry weather, aphids, mites or a virus. Poor soil can also be a problem. So examine the leaves for pests, make sure the plant is getting enough water, mulch well and feed with a general purpose slow release fertiliser. Place the cutting in water a glass jar, cuttings usually root quickly and can can be planted into a container. Change the water every two days. Alternatively you can grow the same cuttings in a sterile potting mix, keep moist and humid.